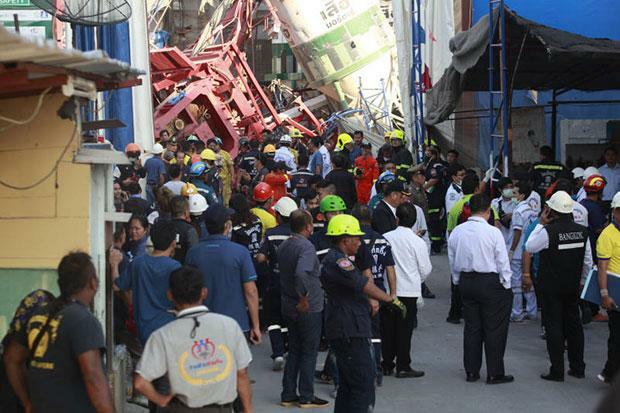 The Council of Engineers wants it made mandatory to get permission before erecting a crane at a construction site in the wake of the accident on Rama III Road in Bangkok in which five workers were killed. At present, there was no requirement for an engineer to even be present, secretary-general Amorn Pimanmas said on Tuesday. Construction cranes were a common sight at high-rise building sites in Bangkok. Over the years there had been many cases of cranes collapsing and causing extensive damage, injuries and loss of lives. The council saw it necessary to investigate crane collapses, determine the causes and work out ways to prevent a recurrence. Last year, five construction cranes collapsed. Already this year it had happened twice. Investigators had found that 80-90% of the time it was caused by faulty installation or misuse of the equipment, Mr Amorn said. There were no engineers supervising the installation of the cranes, he added. In many cases, the collapses were caused by overloading and use of substandard slings, he told a media briefing on lessons learned from previous crane collapses. There was no law controlling the installation of cranes, he said, which meant that no officials were ever sent to inspect the cranes at construction sites. The council believed it was necessary that regulations be incorporated into the 1992 Building Act requiring contractors and subcontractors to obtain permission from the authorities before erecting a crane on a site. The council would forward the proposal to the Public Works and Town & Country Planning Department of the Interior Ministry, and to the Bangkok Metropolitan Administration, the secretary-general said. Five workers were killed and several others injured when a boom broke off while a crane was being extended and fell to the ground at a construction site on Rama III Road in Bangkok on Jan 23. On Jan 11, a crane collapsed while reportedly hoisting 30 tonnes of rocks in Sikhiu district in Nakhon Ratchasima, killing the driver. According to the Engineering Institute of Thailand there have been two other fatal crane collapses in Bangkok since 2017. In April 2017, a crane collapsed at a construction site of the Red Line elevated rail construction in Don Muang district, killing three workers. On Aug 30 last year a crane collapsed at the construction site of a condominium project on Rama 9 Road, killing one worker. And a construction crane also collapsed onto power lines, a shophouse, three cars and two motorcycles on Soi Sala Daeng 2 in Bang Rak district on Sept 14 last year.